Most children learn that birds TWEET and occasionally QUACK. 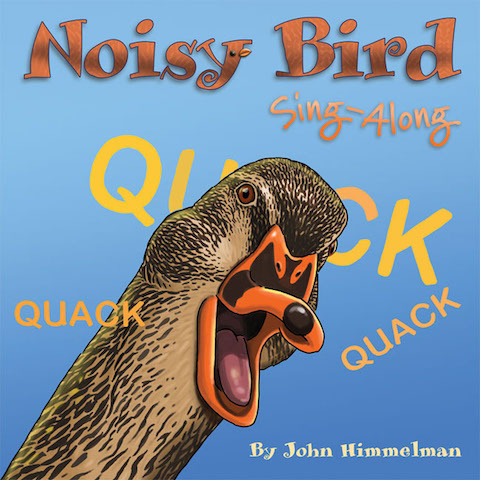 But John Himmelman’s Noisy Bird Sing-Along will expand their bird vocabulary with its fully illustrated pages. This is a colorful, fun, active book for children to practice bird sounds and to learn about different types of feathered friends. Every two-page section focuses on a different bird with facts and emphasized birdsong in exaggerated type. Beautifully images of each bird include visual reflection of the habitat or habits of each winged creature. Whether it’s a black-capped Chickadee, a tapping Woodpecker, or a nocturnal Owl, children will enjoy imitating the sounds and learning more about each bird. The end of the book includes Fun Facts About the Birds and additional activities to continue learning. While this book is recommended for ages 4-9, I think ages 3-7 are more appropriate for the level of tone and facts.